The Peer Recovery Support Center (RLC) is dedicated to promoting the empowerment of peers and their families in a caring recovery of community. RLC is an entirely peer-run community dedicated to providing support, education and advocacy by providing opportunities and resources to assist individuals in finding their own path to mental health recovery. Our Recovery Centers have no barrier of access for people who self-identify as having a mental health issue in the past or present and/or having substance abuse issues. The RLC’s doors are open to everyone and anyone who feels they belong and wants to join a recovery community. Our program helps those it supports analyze their goals in life creating a map that will help an individual support and obtain their life goals. The Centers offer groups that provide connections to others experiencing mental health challenges in a safe environment to learn and grow. Our RLC community members and peer staff are interested in meeting you, sharing thoughts on recovery and talking about their lived experience. We value the lived experience of having a mental health and/or addiction history. Our model is that of equality. Come for an hour, stay for the day, and make friends for a life time. All the services of the Recovery Centers are free of charge. 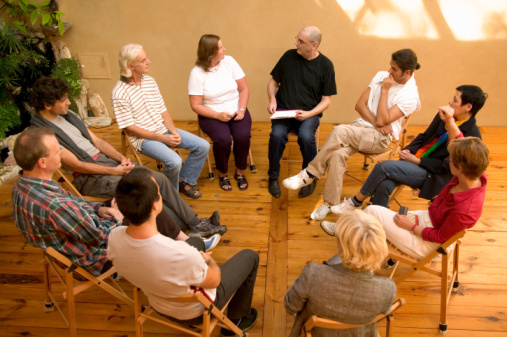 The SRLC is a program designed and implemented by Boston Medical Center’s Recovery Services.